Innovation and creative ideas are increasingly valuable as they help bring new jobs and revenues. In the UK, 6% of businesses are defined as "high-growth" (though not all high-growth businesses are in the high-tech sector) and they create 54% of all new jobs in the country, says two recent reports by the NESTA (National Endowment for Science, Technology and the Arts) -- the UK's Innovation Agency. Despite the high-growth opportunities and rosy startup pictures painted by tech giants such as Facebook and Google, failure rate of startups is high. In the US, three out of four venture-backed startups fail, according to a research by Shikhar Ghosh, a senior lecturer at Harvard Business School--it was reported in the Wall Street Journal in September 2012. Non-venture-backed startups face an even higher failure rate than venture-backed ones in their first four years of operations, mainly due to the lack of capital that sustains a company when its business model fails. All these numbers illustrate one important fact--funding and business supports are crucial during the early stage of a startup. On our home turf, Hong Kong's startup ecosystem has been taking shape in recent years amid rising availability of private co-working space and media hype as well as growing support from the government and industry organizations. Forbes -- in an article published in March 2013 -- has named Hong Kong the world's number one tech capital to watch after Silicon Valley and New York. Invest Hong Kong (InvestHK) of the HKSAR Government also mentioned that startups are on the rise as 15% of the projects it completed in 2012 involved such companies. (how many of these were Technology startups?). There's truth in the claims of Forbes and InvestHK. In recent years, co-working spaces, seminars, networking events, and pitching activities have been flourishing, while tech firms are emerging at an unprecedented rate. StartupsHK -- founded in 2009 with an aim to grow the local startup community--has witnessed a membership growth from five to 5000 in three years. Since 2010 the number of private co-working spaces has kept rising --now there are BootHK, The Hive, CoCoon, The Good Lab, Retro Spot, and others. A group of enthusiastic local entrepreneurs is also taking ground in Fo Tan, forming a robust community in the area. Entrepreneurship activities and events have also received tremendous, favorable feedback. Startup Weekend -- a global grassroots movement for active entrepreneurs to form a team in 48 hours and pitch their startup ideas has taken its foothold in Hong Kong. Since 2010, the Startup Weekend has more than 1,000 entrants with four editions. You'd certainly be able to meet many more passionate entrepreneurs in Hong Kong if you attend regular meetups organized by start Club, Web Wednesday, Mobile Monday --- just to name a few. In the public sector, the government has initiated incubation programs in Cyberport, Hong Kong Science and Technology Parks, and the Hong Kong Design Center to support tech startups. Recently, InvestHK also launched a StartmeupHK Venture Program to support the growth of high-impact ventures on a global scale. As part of the strategies of a recently published document on the Public Consultation on 2014 Digital 21 Strategy, the Office of the Government Chief Information Officer (OGCIO) is developing a one-stop online portal for tech startups to find opportunities. Expected to be launched by end-2013, the portal will provide information on incubation programs, co-working spaces, funding and loan schemes, success stories, and startup events. The portal will enable startups to reach out to potential investors, providing them with pitching and networking opportunities, containing practical business and legal tips with useful templates and samples, as well as listing a pool of mentors offering startups advice. Cyberport has by far the longest-standing in providing a range of support to ICT startups. Since the launch of the Cyberport Incubation Program in 2005, the organization has evolved into a one-stop platform offering support to the ICT start-ups and entrepreneurs from concept generation to prototype development and from setting up their operations to finding investors and expanding to overseas markets. 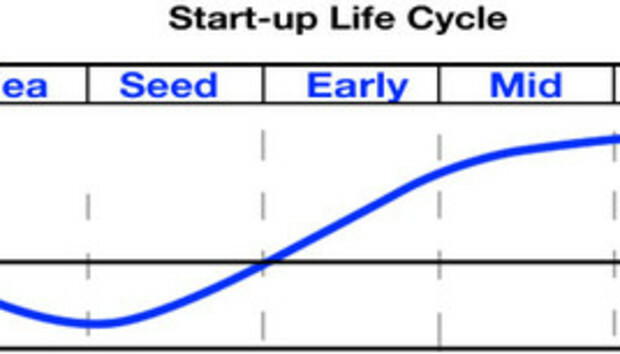 As shown in the following diagrams (click to enlarge), the provision of seed funding, incubation program, professional trainings, brilliant office facilities, technology support, and business support services by Cyberport have significantly contributed to different stages of enterprise growth in the start-up life cycle. To give a further boost to the local startup scene, Cyberport has introduced the Cyberport Creative Micro Fund (CCMF) since 2009, providing a seed fund of HK$100,000 in cash to enable successful applicants to turn their creative ideas into prototype in six months . As of September 2013, the scheme has received a total of 911 applications and awarded 86 grants. Eighty-four percent of the awardees applying for a place in the incubation program were successfully admitted. Since 2005, Cyberport has launched its two-year incubation program which has offered a financial assistance of up to HK$530,000 to each startup. It has successfully bred more than 150 companies in the past 13 intakes with 67% of them still in operation after the incubation period. Professional training in the fields of legal, IP, finance, marketing and business development from the program helps shape up those firms that are ready to seek investment or funding on their own after graduation. Cyberport also sees helping startups tap international opportunities as crucial. Being tuned by world-class accelerator readiness programs co-hosted by Cyberport and local or overseas partners such as Angels Den, startups has secured fundings and won at major pitching events such as e27 Competition and TechCrunch Disrupt. In the past few years, startups from Cyberport secured more than HK$67 million of angel funds and 129 awards including 27 international ones such as Red Herring Global. Hong Kong startups are capable of expanding beyond Hong Kong and China via Cyberport to join world-class incubators and accelerators such as StartX, 500 Startups, Techstars, Y Combinator and similar ones set up by TiE and InnoSpring. Joining these world-class programs enables startups to bolster their businesses by gaining access to the world's best network of professional trainings, business consultation, mentorship, as well as business and institution investment. Apart from the public sector, contribution and support from industry associations are also of paramount importance in livening up the startup ecosystem. The Hong Kong Computer Society (HKCS) -- founded in 1970 with over 9,000 members -- has been the leading non-profit organization that strives to promote ICT professional development and talent cultivation, as well as driving industry development and collaboration in Hong Kong. HKCS has been bringing Hong Kong startups to the international stage, raising their profiles, and increasing their exposure to venture capitalists and other investors. Being an EXCO Member of the Asia Pacific ICT Alliance (APICTA) that organizes the annual APICTA Awards, HKCS leads a Hong Kong delegation to compete with entries from other Asia Pacific economies every year. In 2013, HKCS will soon host the annual APICTA Awards in Hong Kong. HKCS -- together with MoDevNetworks LLC and Cyberport -- has organized the first "MoDev 2013 Conference" in April this year. Originated in the US, MoDev is a fast growing international platform for leading mobile application developers, designers, and marketing professionals to network and exchange views on the evolving trends and applications of mobile computing. Riding on the success of the MoDev 2013 Conference, HKCS will continue to organize the 2014 edition in April next year. All in all, joint effort between private sectors, the public sector, industry associations, and grass-root associations has fuel the growth of the burgeoning local tech startup ecosystem. Although we haven't seen a Facebook-like tech giant from Hong Kong yet, there are definitely many strong local tech startups that have pierced and made their names in the international scene. Some of them include CoachBase, Leovation, Aldiko, Frenzoo, Aftership, and Perpetu Other startups, such as Timable, IT Wake, Bulb B, Innopage, and Nuthon IT Solutions, are seeing robust growth in the local market. With the growing support and a vibrant startup culture, we can expect more and more Hong Kong tech startups achieving global success in the near future. Peter Yan is vice president (Policy and Communication) and honorary secretary at Hong Kong Computer Society and David Chung is director of Industry Development at Hong Kong Computer Society.